Get Ready For Spring with This Hot Kids Scooter! Scooter Wheels: What Do The Specs Mean and Does it Matter? This guide is designed to help you find the best scooter for your kid, no matter what their age, or whether you’re looking for a boys scooter or a girls scooter. 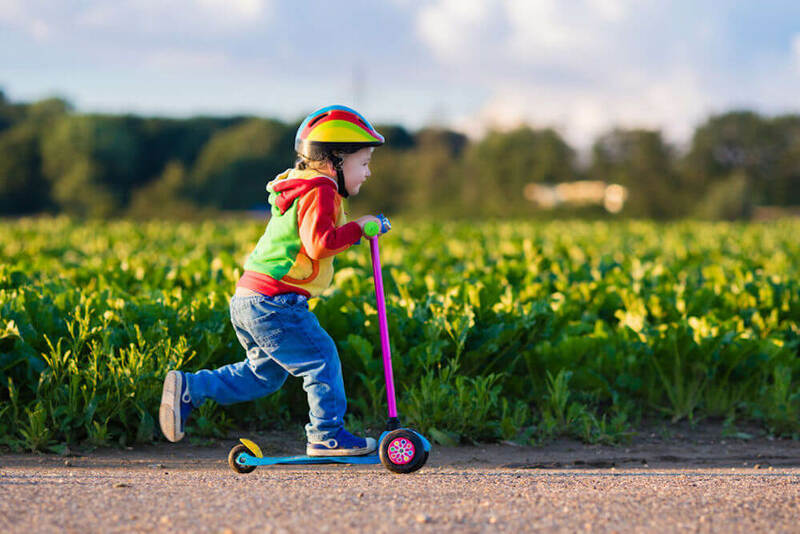 Scooting is such an amazing way to help your kids learn to balance, develop muscle and motor skills, all while having fun and getting exercise. Not all scooters are made with solid materials, not all are adjustable (sounds great, but the perfect kids scooter for you might not be), and some can’t be taken apart or folded down easily for travel. We’re here to help you narrow down your search, and help you find the right one. Before you get started, there are a few things you need to look for. Some design features should be taken into consideration when choosing the best scooter for you child. A note about safety – it’s important to point out that the use of approved helmets is always recommended. Knee and elbow pads are also highly recommended especially at the very beginning. 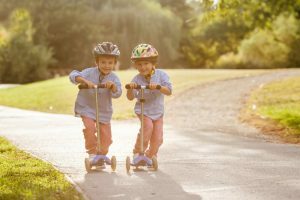 Kids who are just learning to scoot should wear high visibility, or brightly colored clothing and stay away from traffic, stick to practicing on smooth surfaces, and, of course, be under adult supervision. Should You Buy a Height Adjustable Scooter? Which Wheel Size is Better? Is a Foldable Scooter Better? To help make your scooter shopping a bit easier, we’ll start with some terminology. Take a look at the image below at the most common parts discussed in this buying guide. Different Types of Scooters for Kids Now that you’ve seen what and where some of these parts are, let’s set our sights on the different types of scooters out there. 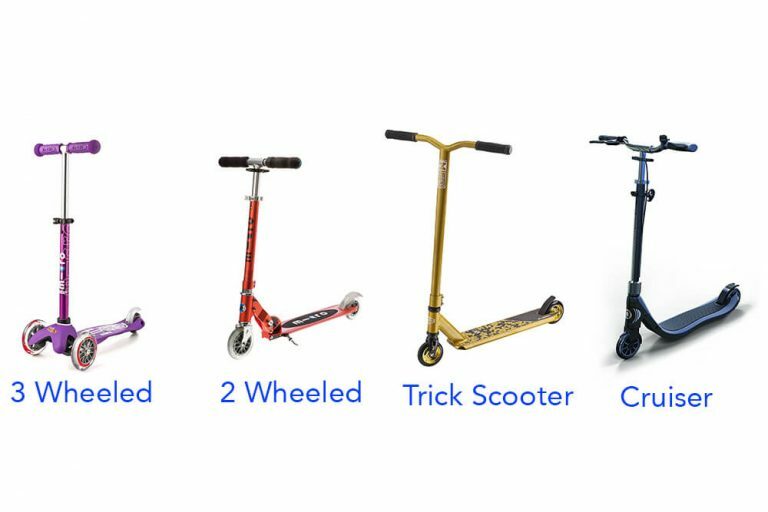 Kids mention all sorts of different terms and brand names that we’re not used to, so let’s take a look at the most popular types of scooters for kids. A great toddler scooter for a 2 year old, and probably up until you’re looking for a scooter for 6 year old kids and older (or whenever you feel your child is ready), will likely be a 3 wheeled scooter for kids in this age range. Once their balance and motor skills have progressed, and you feel they’re ready for a 2 wheeled design, it will depend heavily on their interest, and where and how they will most often use it. Some two wheeled scooters are designed more for speed with larger wheels, some for cruising comfort with suspension, and possibly a hand brake, and some are built for doing tricks and jumps. 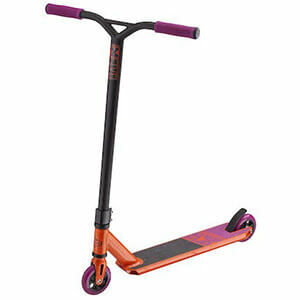 This is not to say that they are all exclusive to those interests, but in the case of trick scooters, for example, they are usually not adjustable, are reinforced with steel or aluminum and have metal core wheels to withstand the abuse of the jumps and tricks. Other models are adjustable and are capable of some tricks, but large jumps and complicated tricks that involve any kind of force on the T-bar could be dangerous. We’ll talk a bit more about that in the Adjustable Handle Height section below. The image below are examples of the types of scooters discussed in this scooter buying guide. As with a bicycle, while kids learn and develop balance and muscle, hand-eye coordination and motor skills, it’s important to start with a three-wheeled scooter to assist them, but still give them the sense of accomplishment. A toddler 3 wheel scooter for very young children should be low to the ground, the ‘decks’ are usually quite narrow, somewhere in the 4-5” width range, any wider and it will be more difficult for the child to control, and the three wheeled models will not go as fast as the two wheeled versions. Models for children in the 2-5 year old range should be a ‘lean to steer’ model. While kids are developing balance, but also their critical and quick decision making skills, leaning to steer is much safer than a model where the T-bar can turn suddenly. Then there is the design of the three wheeled scooter, most three wheeled scooters have two wheels in the front and one at the back, is the preferred version among parents. 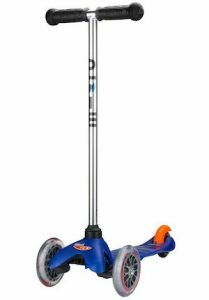 Many reviews of three wheeled scooter designs with two wheels at the back and one at the front say it gets in the way of their ‘kick’ follow through, and the kids get frustrated quickly. Better to look for a 3-wheeled model with 2 wheels in the front, and one at the back. Lean to Steer – helps with balance development, but also helps to avoid accidents. At about the age of about 6+ is the time to look for a two wheeled scooter. However, you know your kid best, if they are already used to scooters, skateboards, or riding bikes without assistance, younger may be okay. Should it Have an Adjustable Handle Height? Are adjustable height scooters better? Maybe. The handlebars should be about waist height for optimal control. Children grow between 3” – 4” per year between the ages of 2 and 5, and about 2” per year after that, so adjustable scooters with a “T-bar” that can slide up and down might be a nice feature. It provides the possibility of sharing with a sibling who is a different height, so for kids of a younger age, this feature is nice to have. Once you kid grows out of it, it will be time to replace. The argument against adjustable handle heights is it may be seen as less durable. Our stance is that this is a nice option for the younger kids, especially in the 2-5 year old range, and older kids who love to cruise around the neighborhood, and are less interested in jumps and tricks at the skatepark. When you don’t want an adjustable height option is older kids who are into doing tricks and jumps at the skatepark. In this case non-adjustable, solid T-bars are the way to go, as they will be more durable and sturdy. This also applies to foldable design options that we cover later on. A kids stunt scooter, or trick scooter, will be solid. Some tricks are aggressive and involve the complete force of the rider’s weight over the handlebars when landing a jump, so you’ll want no possibility of anything collapsing and causing injury. Scooter Wheels – Which Size is Better? Wheel size and wheel type can get quite complicated for very experienced riders, so we’ll keep this nice and basic. The standard scooter wheels are made from polyurethane threads around a plastic core, and a diameter of 110mm. As a general rule, a smaller wheel is slower, but lighter, and keeps the deck lower to the ground which can help with stability, whereas a larger wheel in the 120mm scooter wheels to 125mm will be faster and also raise the deck higher from the ground, and be a smoother ride for the most part. Experienced riders prefer the larger wheels because it gives them more clearance for doing tricks in addition to speed. The width of the wheel is not something most consumers have a choice in. Expert riders will choose wider or narrower depending of they want more traction, or more maneuverability in their stunt scooter wheels, when buying after market, or custom wheels. The material that makes up the core of the wheel becomes important for the pro scooter riders and stunt scooter riders. 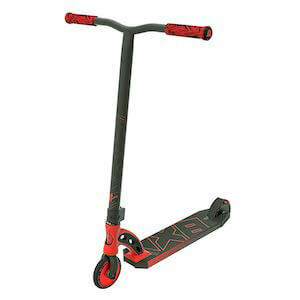 Trick scooter wheels will usually have metal core, rather than plastic, as it provides the durability needed for aggressive jumps. Some are getting into hollow core scooter wheels to make them as light as possible. Some versions of the 3 wheeled models have scooter wheels that light up for the younger kids, with LED lights in the wheels. Might be a fun feature for the little ones. Most scooters on the market today will have some type of slip resistant surface on the foot deck, just like a skateboard. Some models for very young children will have a slip resistant silicone surface. The more recreational two wheeled scooters will usually have grip tape, that sandpaper type stuff applied to all or part of the foot deck. It can be annoying if this starts to peel off, which is more common of the cheaper models, but can be reattached with strong glue or contact cement. The more advanced trick scooters will usually have the grip tape applied to most, if not the entire surface of the foot deck. Do I Need a Foldable Design for Travel and Storage? Foldable scooters won’t be important to everyone, but it is something to consider if you plan on taking the scooter with you on trips. Some kids become quite attached to their scooters and want to bring them everywhere. 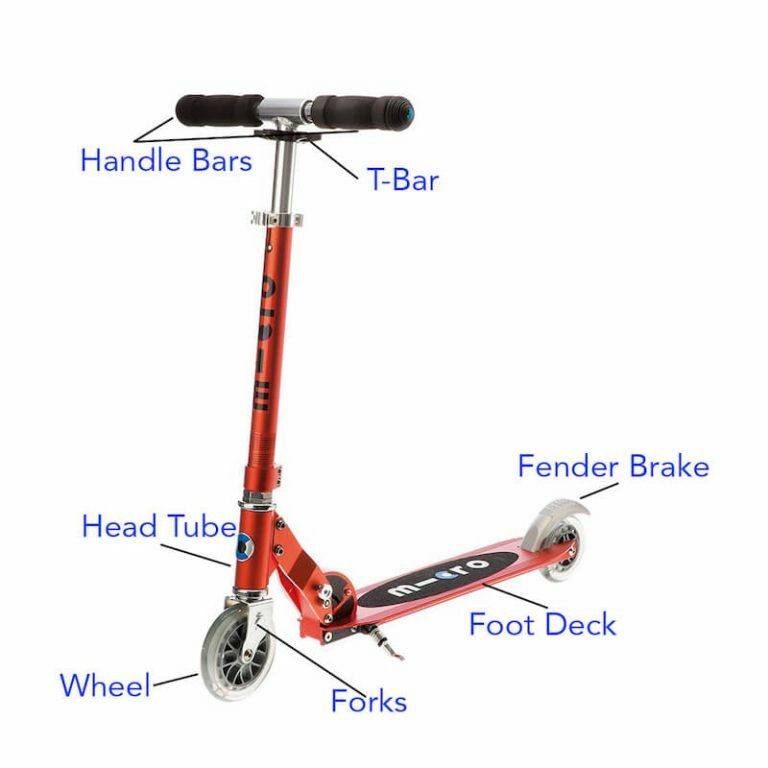 Some scooters have the ability to fold down with the click of a button, in other designs the T-bar can be removed easily and stored as a two-piece. Most 3 wheel scooter designs do not have a fold down feature, but they are quite small, and will have the two-piece option. Something to consider if you plan on taking the scooter with you on trips. 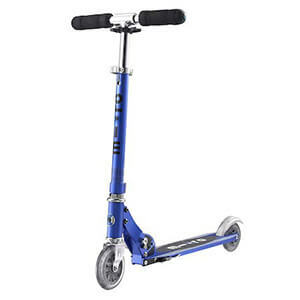 Also, when commuting around the neighborhood with a recreational scooter that folds is great to fit into lockers at school, the garage, the car, and some manufactures sell straps so the folded designs can be easily carried around, or on public transportation. 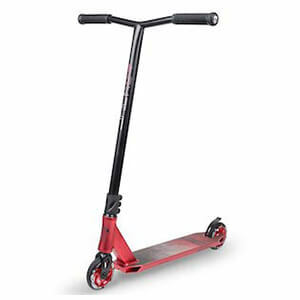 However, as we mentioned before, with trick scooters or pro versions designed for jumps and tricks at the skatepark, you’ll want to look for a model that does not fold down providing a more solid foundation, and does not adjust up and down. 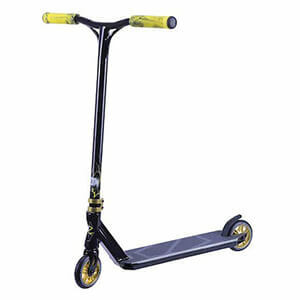 Trick scooters should be solid as they need to be able to withstand a lot of force, and to prevent injury. Awesome Pro Style Scooter for 2019!